Trump Administration Says Companies Can 'Incidentally Harass' Marine Mammals It's a decision opposed by environmental groups, who say the blasts could harm marine animals, and some coastal communities, who fear it could be a precursor to offshore drilling. 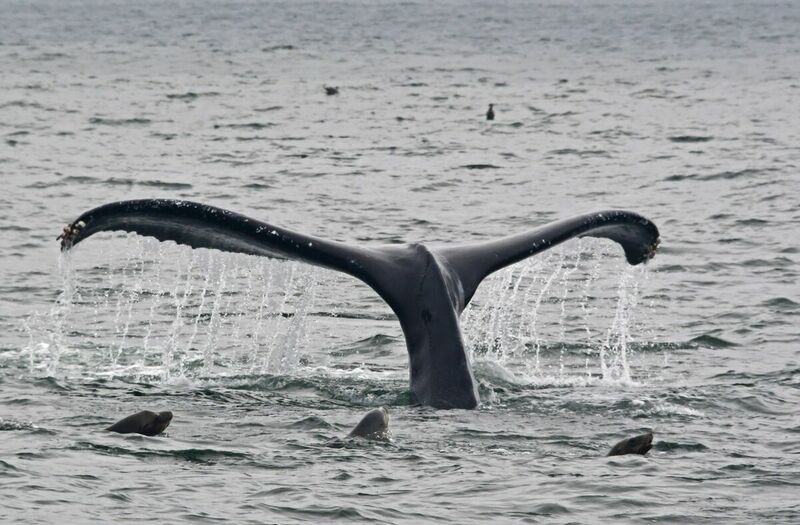 Scientists are concerned the seismic activity could harm animals such as humpback whales. The Trump administration has authorized five companies to "incidentally, but not intentionally, harass marine mammals" by using seismic air guns to search for oil and gas in the Atlantic Ocean. It's a decision opposed by environmental groups, who say the blasts could harm marine animals such as humpback whales, and some coastal communities, who fear it could be a precursor to offshore drilling. The authorizations issued by NOAA Fisheries are not the final step, however – the companies must also obtain permits from the Bureau of Ocean Energy Management before they can start exploring. "Despite the massive, widespread and bipartisan opposition, the president is essentially giving these companies permission to harass, harm and potentially kill marine life – all in the pursuit of dirty and dangerous offshore oil," Diane Hoskins, the campaign director on offshore drilling for Oceana, said in a call with reporters. "The ocean is a world of sound. Marine mammals and many other species rely on their hearing to feed, find mates, avoid predators, maintain bonds between mothers and calves – to do, in short, virtually everything they must to survive and reproduce in the wild," said Michael Jasny, the director of NRDC's Marine Mammal Protection Project. "In this environment so dependent on sound, seismic blasting is an assault." Companies want to use the blasts of compressed air to map underwater geology and search for oil and gas reserves. If approved by BOEM, it would happen over a large area off the central and southern East Coast. John Filostrat, a spokesperson for BOEM, said that the bureau "will complete its environmental review per the National Environmental Policy Act and determine whether to approve the permit applications." He added that this will happen in the "near future." The authorizations require companies to take some steps to reduce harm to marine mammals. For example, observers on the vessels must alert the crew if a protected animal comes nearby. The explorer missions would also have to monitor underwater acoustics for mammal vocalizations, and shut down for certain "sensitive species or groups." According to NOAA biologist Benjamin Laws, if seismic surveying did begin, it would be the first time in decades that it was used in the Atlantic for oil and gas exploration – but it has occurred more recently for "academic research purposes." The Trump administration signaled that it was open to this type of exploration in June 2017, when it published a proposal in the Federal Register to allow five companies to use sound to map the underwater terrain. Some Republicans, such as South Carolina Gov. Henry McMaster, have broken with the Trump administration to oppose the seismic surveying. NOAA has expressed skepticism about the extent of the damage the sound blasts would cause to marine life. "There's growing evidence that these sounds may seriously affect animals swimming well outside the immediate danger zone. Aaron Thode is an oceanographer who's studied the subject and advises the Marine Mammal Commission, a federal agency that regulates activities affecting marine life.
" 'We don't know what happens if animals are exposed constantly to sound over long periods of time in, say, a feeding area or a breeding area or what not,' Thode explains. "Thode works at the Scripps Institution of Oceanography. He says whales have been observed retreating from the sound of air guns. That could cause them to abandon breeding or feeding grounds." The sounds could also impact how animals communicate, he reports, by drowning out their sounds to each other. It's not just marine mammals impacted – other research suggests that the sounds could harm smaller creatures important to the ecosystem, such as plankton. The American Petroleum Institute, an oil and gas trade association, praised the decision. It said in a statement that the surveys must happen so the companies "can make the discoveries of resources that our economy will need for decades to come," and added that it was hopeful this could lead to a full offshore leasing plan in the Atlantic Outer Continental Shelf.